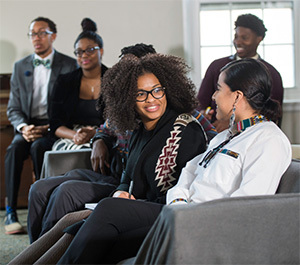 Due to the interdisciplinary nature of African and African American studies, the Frederick Douglass Institute’s research is done in collaboration with faculty from the following departments. In anthropology, Kristin Doughty’s research focuses on understanding how the contemporary global preoccupation with law and human rights as universalizing frameworks for post-conflict reconciliation shape people’s own efforts to rebuild their lives in the post-genocide Rwanda. English Professor Jeffrey Tucker works with the institute to study literature as a context for discussions about racial representation. The institute also does research with Professor John Michael. We work with Professor Cilas Kemedjio, from the Department of Modern Languages and Cultures, to explore the articulation of the shared destinies and misunderstandings that circulate in the realm of transnational black studies. Jennifer Kyker, professor at the Eastman School of Music, collaborates with the institute to study the mbira dzavadzimu, an instrument played at various ritual events within Zimbabwe. She also explores how women navigate expectations of gender in mbira performance, as well as the evolution of neo-traditional musical styles, such as the contemporary Zimbabwean marimba. In religion and classics, Margarita Guillory works with the institute to research African-American religions and American religious history. Faculty and students engage constantly with the many interdisciplinary pursuits being undertaken throughout the University. A wide variety of courses, conferences, lectures, research seminars, reading groups, and work-in-progress colloquia are sponsored by the various humanities programs, departments, and initiatives at the University of Rochester.